From burlesque to family theater, a Magna landmark rises again. Many architecture enthusiasts insist that while a building may be inanimate, it has its own vibrant life similar to that of a human being. The life story of Magna’s 91-year-old Empress Theatre—which began as a seedy burlesque for miners and now functions as the home of the family-friendly Orquirrh Hill Performing Arts Alliance—is as colorful as that of any person who has persevered for nine decades and lived to tell the tale. In the early years of the 20th century, workers from all over the world began to immigrate to Utah, lured by the state’s burgeoning mining industry. In the early 1900s, the area that is now the city of Magna was a sparsely populated outpost peopled primarily by young, single men engaged in back-breaking labor. Needless to say, there were many in this demographic who were not interested in wholesome entertainment. Therefore, in 1916, an eager entrepreneur—whose name has been lost—opened a burlesque on Magna’s up-and-coming main street. In 1917, the burlesque morphed into a movie theater that showed silent films. As families steadily began to outnumber the lone workers of the region, the content of the theater’s film reels became less adult and more family-oriented. Vivian Kunz—a founding member of the Oquirrh Hills Performing Arts Alliance—explains that in the 1940s and 1950s, the dark rows of the Empress were policed by a puritanical theater owner named Smith, who would thump couples he believed were getting too close with a large metal flashlight. In a span of less than 50 years, the Empress transformed from a venue that hosted live strip-tease acts to a squeaky-clean Saturday-night date destination whose patrons were expected to adhere to a strict hands-to-yourself policy. In the mid-1950s, the Empress Theatre went of business and, despite the efforts of film historian Stephen Barker, lay dormant for nearly 30 years. The building—with its signature columns and turn-of-the-century marquee—would have been demolished if not for Leo W. Ware, a prolific Hale Centre Theatre actor who acquired the space in 1983 to indulge his lifelong passion for community theater and historic buildings. Ware, who was well into his 60s, spent more than $30,000 and countless hours renovating the rickety Empress. He saw great potential in such a distinctive space—a cavernous building with a stylized, classical façade, towering ceilings and a spacious lobby that stood in the shadow of a copper smelter—so he single-handedly dug out a basement, built walls, re-did the floors and ceilings and rearranged the theater’s seating. But the fate of the Empress Theatre appeared to be tragically sealed when Ware was involved in a devastating car crash five years ago. In the wake of the accident, dementia seized Ware’s sharp mind, and he was forced to cease working on his beloved theater. Once again, the theater lay dormant—until 2006, when a group of about 40 people who dubbed themselves the Oquirrh Hills Performing Arts Alliance, intervened to save the Empress. Jolene Walgamott—a tireless member of the Alliance—says it took thousands of volunteer hours and a harrowing struggle to get the building ready for a live audience. Jolene’s husband Rod Walgamott is also an alliance member. He owns a real estate firm in Magna and channeled Ware’s fervor to secure the Empress because he believed that the theater had the potential to become a vital cultural and economic nucleus. “Everything was wet the night we opened: The ink on the playbills, the paint on the walls and the tears on our faces from the frustration of wondering whether we were going to be able to open our doors,” Jolene says. 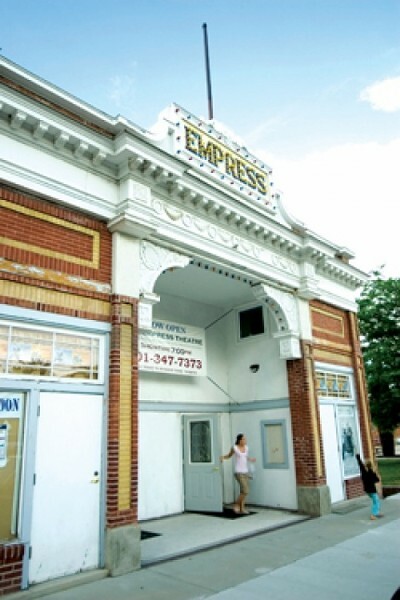 On Nov. 10, 2006, the Empress finally reopened. The alliance received the proper permit mere hours before the curtain was to rise. Forever Plaid was the alliance’s first production, and Leo Ware—shortly before his January 2007 death—was in attendance. Although Ware appeared dazed for the bulk of the performance, near the end he lifted his head and clapped vigorously with the rest of the audience. The Empress has hosted six community-produced plays and musicals since November 2006. Leslie Reader—a veteran actress who is courageously mutli-tasking by serving as director and playing Rose Alvarez in the Alliance’s latest production, Bye Bye Birdie—says the Empress is beginning to attract interest from all over the valley. The Empress lives on, and the theater has hosted events including fund-raisers, dance performances and church gatherings of every persuasion since its resurrection less than one year ago. Ware’s dream of a vibrant community theater and Rod Walgamott’s vision of a revitalized Magna main street appear to be coming to fruition simultaneously. The theater may be a nonagenarian, but the Empress is looking livelier than ever.